I’ve been a regular user of protein powder supplements for quite some time. I particularly look for plant-based, vegan options that are gentle on the stomach, with no artificial flavors or preservatives. Quality protein powder is a great booster for a morning smoothie, a quick post-workout shake, or just a mid-day snack. It helps keep me full, and also ensures I get adequate protein intake daily. That being said, we’re excited to be collaborating with Plant Fusion for a series of giveaways these upcoming weeks. Each week, we’ll share and review one of their plant-based products and also offer readers a chance to win some Plant Fusion products for their own to try. 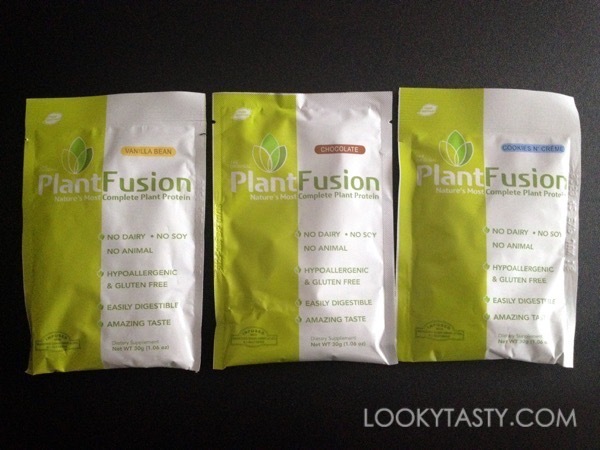 Plant Fusion offers a line of plant-based protein supplements. This week I’m sampling their Plant Fusion Protein. It’s free of dairy, soy, gluten, egg, nuts, and common food allergens. Most commonly, vegan protein powders tend to utilize soy and/or rice for their protein source. Plant Fusion, on the other hand, gets its protein from organic, sprouted quinoa, organic, sprouted amaranth, yellow peas, and artichoke. Each serving provides 21 grams of protein along with 4500mg of branched chain amino acids (BCAA) and 3,350mg of glutamine. There’s also a blend of digestive enzymes to help ease the digestion process. I received individual packets of their Vanilla Bean, Chocolate, and Cookies N’ Creme flavors to review. Each serving makes a 12oz shake. The simplest way to enjoy it would be to mix it with water in a shaker, but everyone has their own preferences. Personally, I prefer powders that at least mixes well with just water. That way I can have it while I’m on the go and not worry about having additional mixers or beverages with me. I also look for powders that blends with other things so that I could easily make protein smoothies and desserts. The protein powders do mix well in liquid simply using a shaker bottle (as long as you put the powder after the liquid). It adds a little thickness to the liquid (not much really) and there’s no funny chalky texture. When I mix it in a blender (for smoothies, etc. ), the powder pretty much dissolves. The protein powder is sweetened with some fructose and stevia. I’m not super sensitive to stevia. I can definitely recognize it but it’s doesn’t leave an aftertaste at least for me. I do like the variety of flavors – Vanilla Bean, Chocolate, and Cookies N’ Creme. Vanilla Bean shaken with almond milk and chia seeds made a satisfying mid-morning snack. Chocolate blended with water and ice made refreshing chocolate slush. And Cookies N’ Creme shaken with almond milk was a total post-workout delight. Open to US residents. Giveaway ends Tuesday, July 21st at 11:59pm EST and a winner will be randomly selected shortly after. Quality ingredients, soy-free, gluten free protein powder. something easy to use honestly. and tastes good. I look for taste. It has to taste good! I look for ones which are easy to mix and also have plenty of protein. Thank You for the giveaway…we prefer a soy-free protein source, with a variety of flavors…that taste great !